Training for a sport is only half of your success when you’re into extreme sports. Nowadays athletes are turning to fitness to improve their skills. Functional training (a style of training which mimics the movements from your sport) is extremely crucial when mastering your craft and something you must figure out before beginning any type of routine. When you start any training program always get confirmation from your family doctor and make sure you understand what movements your sport demands. 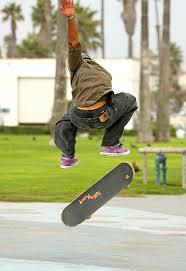 Skateboarding is a sport that has been around for over 20 years and is not showing any signs of fading. Whether you participate recreational or compete it is a great mode of transportation and method to keep in shape. It beats sitting in front of the T.V. any day. To train functionally for skateboarding you should be looking at core, power and strength exercises. Core exercises will assist with stability on the board, power will assist with ollie’s and grinds and strength will assist with speed, stability and power. Start prone on the floor. Use your arms to get up to a standing position but unlike a burpee you’re going to rotate your body mid jump to land with 1 foot forward. Jump back down to the floor. Jump up to the other side. Repeat for 1 minute. Stand on top of a bosu and step 1 foot behind you so it lands on the floor. Bend the knee towards the floor and then step back onto the bosu. Repeat on the opposite side and keep alternating for 20 reps each. If you don’t have access to a structured fitness box use a bench. Stand with both feet hip width apart on the ground and jump up onto the box with both feet. Land in a squat when you get on top of the box so you protect your knees. Jump back down bending your knees again so you absorb the jump. Repeat for 20 reps.
Place pylons or objects 15 feet apart. Stand in the center and side shuffle from pylon to pylon for 30 seconds. Ensure you touch the floor each time and stay up on the toes so you are more agile. Start in a prone position with your elbows and feet in contact with the floor. Ensure your entire body is raised off of the floor. Open the entire body up to 1 side bringing the arm up in the air. Place the hand down on the floor and open to the opposite side bringing the opposite arm up in the air. Place the hand down on the ground and open again to the first side. Place the elbow down on the ground. Open to the opposite side and when you return to the front plank place the elbow on the ground. Keep alternating between the hands and elbows for 1 minute. Start in a supine position with arms and legs straight out in front and behind you. Sit up bringing your left hand towards your right foot while maintaining a straight leg. Go back returning your head, shoulders and leg back to the floor. Repeat on the opposite side. As you come up rotate the torso to ensure you are targeting the rotational muscles.